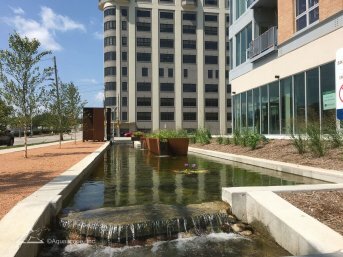 This grant will support development of a stormwater feature at the new Freshwater Plaza near the gateway to School of Freshwater Sciences in the Walkers Point neighborhood of Milwaukee. The water feature will manage the volume of a 2” rain event over its 33,000 s.f. catchment area and will feature several emerging and innovative green infrastructure technologies being developed the University of Wisconsin-Milwaukee and several local start up businesses.